(WACO) – Three recent Texas State Technical College graduates gave their fathers plenty of reasons to smile. Bailey Bowers, 20, and Jason Z. Mallory, 20, received Associate of Applied Science degrees in Electrical Power and Controls and Nate Hutchison, 18, received the Associate of Applied Science degree in Robotics Technology at TSTC’s Summer 2018 Commencement in mid-August. And, they all started full-time jobs in late August. Their last names are recognizable on campus. Bowers is the son of Michael Bowers, TSTC’s vice president of student learning, Hutchison is the son of TSTC Provost Adam Hutchison, and Mallory is the son of Jason Mallory, director of internal audits. The younger Bowers grew up in Clifton and graduated in 2016 from Meridian High School. He originally wanted to continue pole vaulting in college, but saw what his relatives were doing in their careers and wanted to follow suit. The younger Bowers continued a family tradition of majoring in Electrical Power and Controls at TSTC. He counts his father, older brother and cousins as TSTC alumni. Bowers awarded his son his degree at the graduation ceremony. The younger Bowers works in computer research and equipment for projects at Oncor in Sherman. The journey for Hutchison’s son to become a TSTC graduate at 18 began with a toy. The Hutchisons visited TSTC’s Robotics Technology program, and the younger Hutchison was interested. 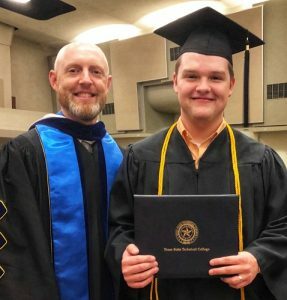 “Because he started with dual credit, he was usually younger than other students in the cohort, but they treated him like everyone else in the program,” the provost said. The younger Hutchison did an internship, which has now turned into a full-time job, as a software technician at Fallas Automation in Waco. “I use everything I learned at TSTC on my job, and though I’m still learning every day on the job, I was very well prepared for work,” the younger Hutchison said. Mallory brought his son, who graduated in 2016 from Rosebud-Lott High School, to visit TSTC during his senior year. Mallory said TSTC gave his son the opportunity to see what he was capable of. “This place taught him the way he learns and gave him confidence,” said Mallory. After his first year at TSTC, the younger Mallory got an internship at Commercial Metals Co. Construction Services in Seguin and was offered a full-time job by last Christmas contingent on graduation. The younger Mallory said he was glad to start work with no college debt. “TSTC did exactly for me what I was told it would do,” he said.